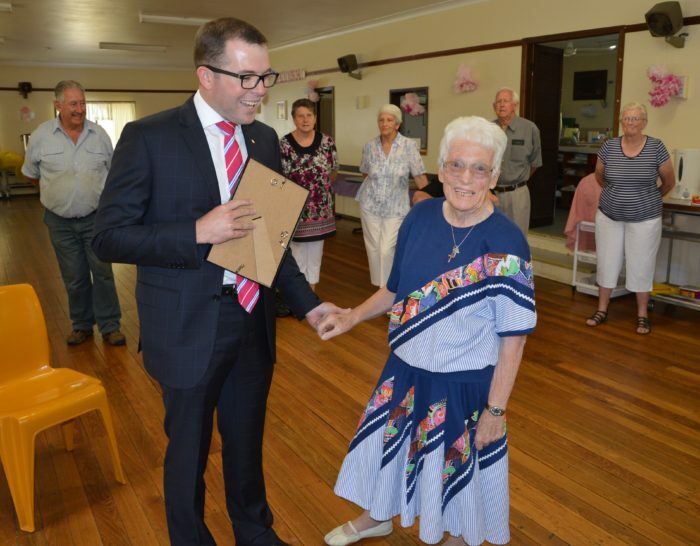 MEMBER for Northern Tablelands Adam Marshall has today announced Glen Innes resident and community stalwart Jan Sharman OAM as the Northern Tablelands’ 2016 Local Woman of the Year. Mr Marshall made the announcement and presented Mrs Sharman with a certificate at a special surprise morning tea in Glen Innes, attended by Mayor Col Price and community members. The MP said the award was recognition of the outstanding contribution Mrs Sharman had made to the community over her lifetime. “Jan was an obvious choice for this award,” he said. “She is highly respected and loved in the community for her more than 40 years of community service to a wide range of organisations and causes. “Jan is a wonderful advocate for her community. Not only has she been a member, president, secretary, treasurer and dog’s body for many organisations in Glen Innes; she has also been at the forefront of quite a few dog fights with bureaucracy, politicians and anyone else who stands in her way in ensuring that her beloved community of Glen Innes goes ahead. “At 78, Jan is still an active member of the Anglican Parish Council, for which she has worked tirelessly for more than 40 years. As head of the Holy Trinity Anglican Church catering committee for over 30 years, Jan ensured that no-one who attended a church function went away without a cuppa and a scone. “She is still a committee member of the Corinya Retirement Village and Community Information Centre and for many years she worked at her children’s school canteen, even after they had left school. Mr Marshall said Mrs Sharman had been a member of the Glen Innes Hospital Auxiliary for more than 40 years and helped raise hundreds of thousands of dollars for the hospital to purchase much-needed equipment to support the work of the hospital staff. “Her most recent campaign has been to spearhead the push for a helipad to be built at the Glen Innes hospital,” he said. “The auxiliary has already raised more than $80,000 and the community has pledged further funds when the construction date is settled. “The campaign has not been an easy one and on many occasions Jan has locked horns with the health bureaucracy, when a project has not moved fast enough for her liking. “When we achieve the helipad, it will be another tangible reminder of Jan’s determination and a wonderful legacy. Mrs Sharman has previously been acknowledged with a Medal of the Order of Australia in 2013 and as a Glen Innes Citizen of the Year.